Last year, India had moved up 30 places to 100th position. According to the World Bank EODB 2018 report, released on October 31, 2017, India was among the top 10 countries that had shown an improvement. Last year, India had moved up 30 places to 100th position. The World Bank’s “ease of doing business (EODB)” rankings will be announced Wednesday. On Tuesday, Commerce Minister Suresh Prabhu hinted that India is likely to move up the rankings. The EODB rankings are intended to give a measure of how friendly the regulatory environment of a country is for doing business. Last year, India had moved up 30 places to 100th position. According to the World Bank EODB 2018 report, released on October 31, 2017, India was among the top 10 countries that had shown an improvement. India had improved on eight out of 10 indicators for “Doing Business”. India’s position in the area of “resolving insolvency” was 103rd, up from 136th position in the previous year. In the category of “paying taxes”, India moved up to 119th position in the report released last year, from 172nd position in the previous year. 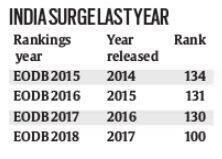 In 2016, 2015 and 2014, India had not improved much and was placed at 130th, 131st and 134th positions respectively. Last year’s improvement, the World Bank said, came on the back of “sustained business reforms” over the previous four years. India ranked among the top 5 in the world for protecting minority investors and in the top 30 in three more indicators (protecting minority investors, getting credit and getting electricity), Annette Dixon, Vice President, South Asia region, World Bank, said last year. Last year, a release by the World Bank noted that the time taken to enforce a contract is longer — 1,445 days — than it had been 15 years earlier (1,420 days), placing the country at 164th place in the global ranking on the Enforcing Contracts indicator. In a move that may help curb rupee volatility on account of imports from Japan, India and Japan Monday concluded a Bilateral Currency Swap Agreement for $75 billion, a 50% enhancement over their previous $50 billion currency swap agreement. The rupee has been under pressure, depreciating by 15.7% in this calendar year. In the last three months the rupee has fallen by 7.4%, forcing the government to look at measures to stabilise its value. Currency swap agreements involve trade in local currencies, where countries pay for imports and exports at pre-determined rates of exchange without the involvement of a third country currency like the US dollar. It reduces the risk of volatility against the third currency, and does away with the charges involved in multiple currency exchanges. The swap agreements will help address possible short-term liquidity mismatches, and supplement existing international financial arrangements. Such agreements help in saving for a rainy day when the economy is not looking in good shape. “This agreement will give India access to $75 billion of forex reserves as and when required by paying in rupees. Oil prices and the strength of the dollar will remain exogenous factors, so if the requirement for dollars goes up, this pact will help,” said D K Pant, chief economist, India Ratings. Pant said India is not facing balance of payments difficulties as of now, but such measures will help make it an attractive investment destination for foreign investors. “The present currency weakness was triggered by demand-supply mismatch of the US dollar. Right now, the outflows of US dollars are greater than inflows, and this situation is unlikely to change very soon. So, there is a need to take such steps to make India more attractive for foreign investors,” he said.